work continuously without the battery! 【Quick Charge, Slim, lightweight design, Simplifies storage】Power Supply your compatible Macbook laptop with this 45W Magsafe PowerFast AC Adapter charger, which features built-in surge protection to help guard against damage. 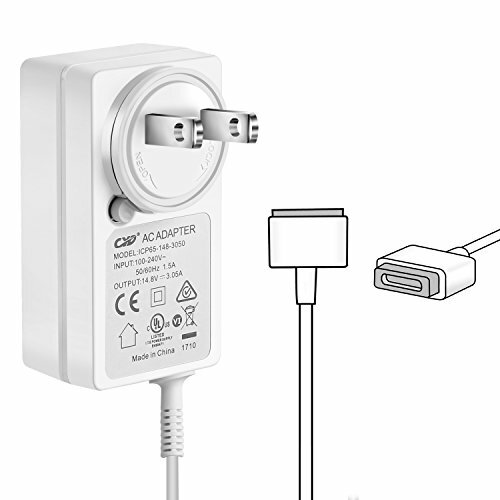 Power cord Input: 100-240V 50-60Hz, Output:14.85V 3.05A 45W , Power AC Adapter Charger for MacBook Air 11-inch 13-inch Md711ll/A Md712ll/A Md760ll/A Md761ll/A Md711ll/B Md712ll/B Md760ll/B Md761ll/B Mjvm2ll/A Mjvp2ll/A Mjve2ll/A Mjvg2ll/A. 【Cheap Reliable Replacement】.QYD 45w macbook charger replacement for Macbook Mid 2012 to Early 2015 11"13" inch, Md711 Md712 Md224ch MD223 MD223ZP/A MD224ZP/A MD231ZP/A MD232ZP/A MD224 ,MD224CH/A,MD231CH/A MD232CH/A. 【Take the power in your hands with a sleek and compact adapter that works with almost any portable PC 】QYD 45W power cable for MacBook Air (11-inch, Early 2015) ; MacBook Air (13-inch, Early 2015) ; MacBook Air (11-inch, Early 2014) ; MacBook Air (13-inch, Early 2014) ; MacBook Air (11-inch, Mid 2013) ; MacBook Air (13-inch, Mid 2013) ; MacBook Air (11-inch, Mid 2012) ; MacBook Air (13-inch, Mid 2012),MacBook Air 11" 13" inch from End 2012 885909611522 885909611560 885909611607. 【UL LISTED】100% tested, with UL CE FCC & RoHS approved for safety and quality assurance.QYD provides 1 year Warranty, 1 month money return guarantee and 24H x 7 email support. If you have any questions about this product by QYD, contact us by completing and submitting the form below. If you are looking for a specif part number, please include it with your message.